Prof. István Szilárd MD., PhD. 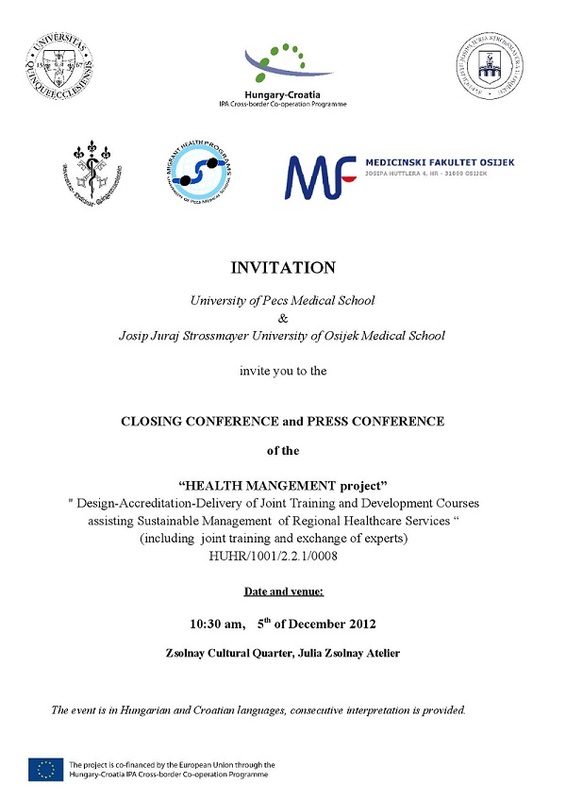 will be a keynote speaker on the 18th International Congress of Rural Health and Medicine which has the main theme of "Challenges of Rural Medicine in a Global Village" between 10-12 December 2012. 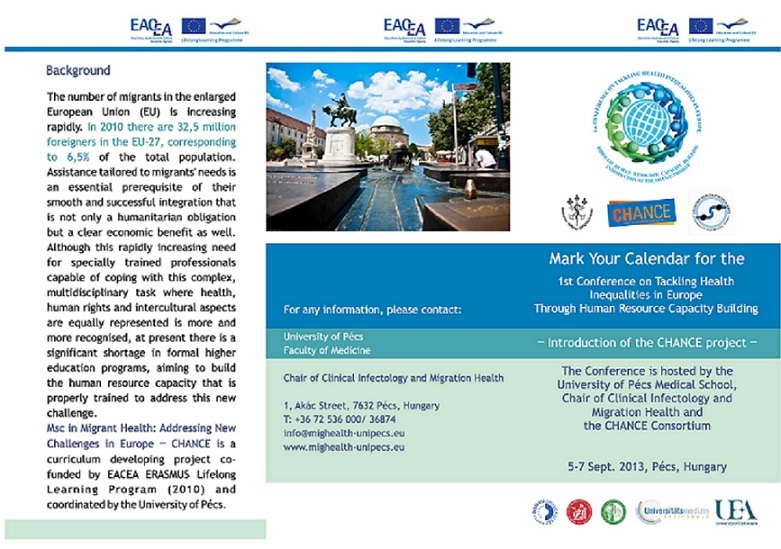 He will introduce the CHANCE project on the conference, and promote the closing conference titled Tackling Health Inequalities in Europe Through Human Capacity Building which will be held in Pécs next September. We have started the development of the CHANCE website where more information on the closing conference titled Tackling Health Inequalities in Europe Through Human Capacity Building will be posted. Going online in January, the website will contain a registration and abstract sending form, accommodation tips and information of Pécs as well. The 2nd newsletter of the project will also be published in January. The representatives of our Department – Prof Dr István Szilárd, Dr Szabolcs Fekete, Dr Zoltán Katz and Zsófia Freund – gave an account of the program which aimed to develop an internet-based platform for professionals, based on the framework of Open Society Foundations- Roma Health Network, at the Budapest Office of the Open Society Institute on 14 September 2012. The network that has been developed by our colleagues and named RomaHealthNetwork was introduced on the meeting. The website with the domain www.romahealthnet.org aims to offer new perspectives for researchers, educators, decision-makers concerning health policy, and any other professional working in this field by combining several functions. The website strives to incorporate the main functions of databases and social network sites, ensure one’s opportunity to follow up on events concerning the topic, and help in making contacts on a moderated forum. An agreement came into existence on the meeting regarding the future cooperation which is thought to be important and useful by both parties in the development and improvement of the health and social state of the Roma. However, our colleagues and the representatives of the institute agreed to further develop the RomaHealthNetwork that has been established by them earlier. The representatives of our Department participated in a workshop which was held under the framework of the IPA Cross-border Co-operation Program(Hungarian-Croatian Regional Cross-border Cooperation Program) in Osijek, Croatia on 10-11 September 2012. The curriculum of the six module postgraduate course, “Health Management”, which has been developed in the framework of the project, was introduced by the module developers, and it was adopted by the Accreditation Committee of both institutions unanimously. Dr Péter Németh, Dr Gábor Ternák and Dr Lajos Bogár represented our Faculty in the Accreditation Committee. On 12 September 2012, representatives of the Hungarian Baptist Aid visited the Department of Infectology, Catastrophe Medicine and Oxyology to discuss the future cooperation. Several common issues and goals have been unraveled in the work of the two institutions during the introduction which could be a good basis for joint projects in the future. The two parties agreed to support each other, outlined the basis of the cooperation, and assigned the first duties to each other. The Department of Infectology, Catastrophe Medicine and Oxiology attended the 6th conference organized by the National Union of Public Health Education and Research Institutes in Budapest. Prof Dr István Szilárd, Prof Dr Árpád Baráth, Dr Antal Tibold and Kia Golesorkhi: Development of a cross-border public health education program within the framework of the IPA Croatian-Hungarian cooperation program that is co-financed by the EU. Dr Zoltán Katz, Erika Marek, Prof Dr István Szilárd: Development of recommendation for migrant vaccination as a new EU policy health priority. Prof Dr István Szilárd held a three-day training within the BOMCA (Boarder Management in Central Asia) program concerning the health and healthcare problems connected to the responsibilities of border guards of the five partner countries in Almaty, Kazakhstan. He introduced the research of our university which had been conducted along the whole stretch of the Schengen border in Hungary, Slovakia and Poland. The conclusions of this research were adapted to the problems of the BOMCA countries during the training. The program is funded by the European Union. On the 3rd HEALTH MANAGEMENT project's workshop the Accreditation Team was established. Both partners delegated their members to the local accreditation committee. Members of the accreditation team were introduced with each other, and went through on the training materials for the postgraduate and undergraduate courses. The delegated members will be responsible for the coordination of the accreditation.